Alexandre Schwab joined LALIVE as an associate in 2018. His practice focuses on domestic and cross border litigation. Before joining LALIVE, Alexandre Schwab trained with Pestalozzi Attorneys at Law (2016-2018). 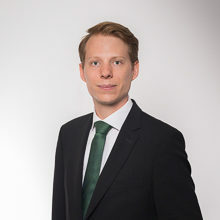 Alexandre Schwab graduated from the University of Geneva with a Certificate of advanced studies in legal professions (2016), a Master in Law (2016) and a Certificate in Transnational Law (2015). During his Master he spent a semester studying at the University of Toronto.